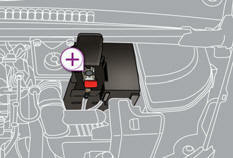 The presence of this label indicates the use of a 12 V lead-acid battery with special technology and specification, for which the involvement of a PEUGEOT dealer or qualified workshop is required when replacing or disconnecting the battery. Failure to observe this recommendation may cause premature wear of the battery. if necessary, unclip the fusebox to remove the battery. Raise the locking tab D fully to release the cable terminal clamp E .
Position the open clamp E of the cable on the positive post (+) of the battery. Press vertically on the clamp E to position it correctly on the battery. Lock the clamp by spreading the positioning lug and then lowering the tab D .
Do not apply excessive force on the tab as locking will not be possible if the clamp is not positioned correctly; start the procedure again. When your vehicle's battery is discharged, the engine can be started using a slave battery (external or on another vehicle) and jump lead cables. 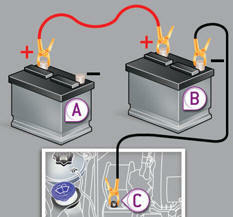 Start the engine of the vehicle with the good battery and leave it running for a few minutes. Wait until the engine returns to idle then disconnect the jump lead cables in the reverse order. Protect your eyes and face before handling the battery. All operations on the battery must be carried out in a well ventilated area and away from naked fl ames and sources of sparks, so as to avoid the risk of explosion or fi re. 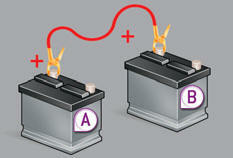 Do not try to charge a frozen battery; the battery must first be thawed out to avoid the risk of explosion. If the battery has been frozen, before charging have it checked by a PEUGEOT dealer or a qualified workshop who will check that the internal components have not been damaged and the casing is not cracked, which could cause a leak of toxic and corrosive acid.